Throughout history, throughout most of the world, psychopaths have gotten a bad rap. That is quite understandable since almost all of the world's religious and social philosophies have little use for the individual except as a tool to be placed in service to their notion of something else: "God," or the "collective," or the "higher good" or some other equally undefinable term. Only rarely, such as in Zen and Tibetan Buddhism, and some school of Existentialism, is the individual considered primal. 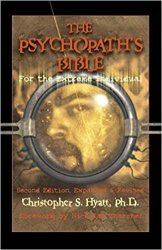 Here, finally, is a book which celebrates, encourages and educates the best part of ourselves--the Psychopath. "You take people as you find them. They all have a secret life inside, and they usually die with it never coming out. That is the waste; the waste is not something they are not...the waste is not living what they are; however, what they are came about...came into existence...so what you do with your cards is what is important." -- Christopher S. Hyatt, Ph.D.